The S5 Image Slide module is demo'd at the bottom of this page. It is a responsive module that will automatically adjust to the width of any screen. After installing the module be sure to add in below positions to your template details.xml file located in the root of your template folder. If you are running a template older than Maxed Mag or a non Shape 5 template. Once you are sure you have the module positions in then just simply start publishing modules to the positions. Be sure to do them in order, not imageslide_1 and then imageslide_4. Be sure its in sequential order. 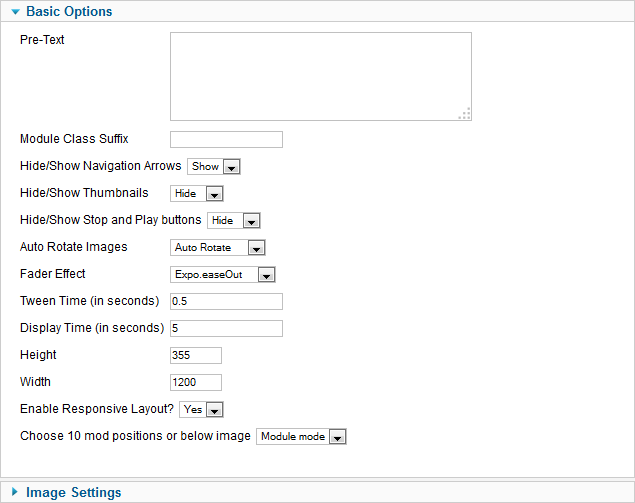 After installing the module simply publish it to your site and add URLs to images located on your server. As you can see from the below screenshot you need to enter the URLs to the images, once this is done the fader will start cycling through the images, be sure to add them in order from 1 - 10.